Mill Hill’s commitment to the environment is long-standing, and proactive, and we are enormously proud of our achievements in this area. Meetings of the ‘Eco Society’ take place regularly each half term with members actively engaging in a number of projects that raise awareness of, or have a positive impact on, the environment. 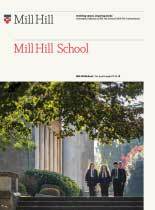 Mill Hill pupils also get involved in these projects through the curriculum, inter-House competitions and activities as well as whole school initiatives.